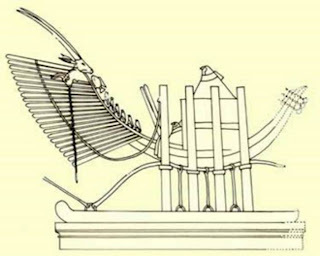 Henu Barque from Papyrus of Ani. Giger appears to have taken the design of the Space Jockey in another direction far beyond Ridley's initial concept, for a good couple of decades I wondered what exactly it could have been, to me it seemed as if there was some completely unimaginable source of inspiration that took the the direction of the design into something incomprehensibly different. If there was a mysterious sculpture or design to know about from the Ancient Egyptian traditions I didn't know about it. There was absolutely nothing in the book H.R.Giger's Alien about this matter regarding the Henu Barque having not been mentioned at all in any of the known books or interviews with Giger but we know that he does draw ideas from Ancient Egyptian Culture from looking at his paintings. 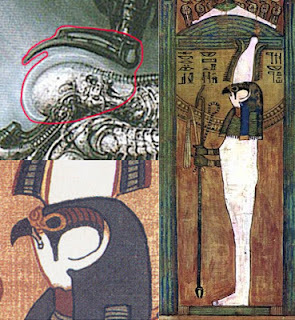 We have seen his obvious use of the sky goddess Nut in the Life Cycle hieroglyphics tableau, and we can see enough from the image from Ani's version of the Book of the Dead to how this is a key structure that served as a basis for the Space Jockey and its chair. 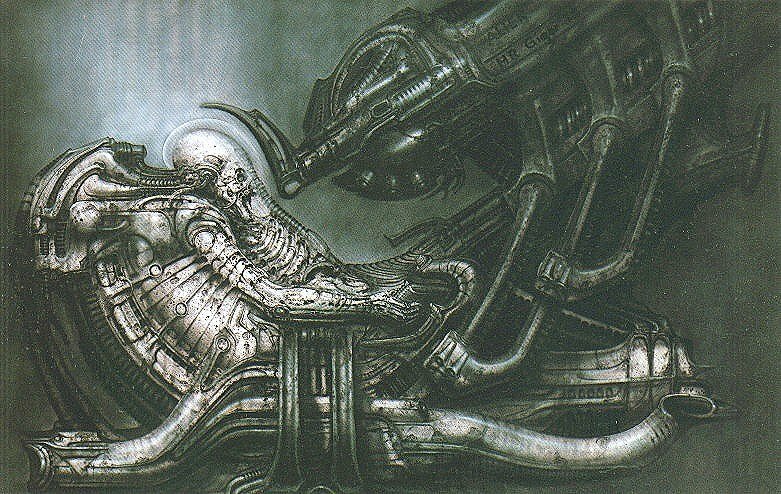 Perhaps Giger's painting Necronom IV featuring the creature that inspired the main structure of the final alien life form design in the movie was also loosely inspired by the same images of the funerary barqur. I went to see "The Egyptian Book of the Dead" exhibition at the British Museum on January 14th 2011. 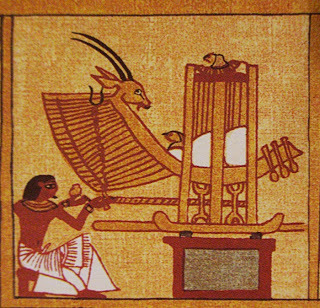 When I looked at the section displaying the the Papyrus of Ani, a very curious detail jumped out at me as it if were a strange creature with a rib cage extending behind it and a long legless trunk like body and an animal head at the top of the body supported by a cradle with three pillars. I immediately thought that this could easily be the inspiration for Giger biomechanoid. 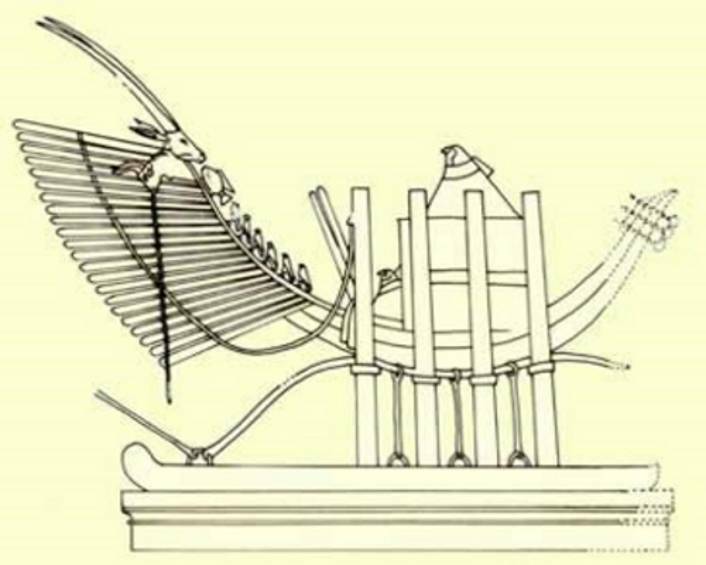 This small image was in fact a depiction of a sacred bark/ barge dedicated to the funerary god Sokar. 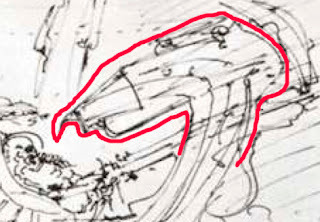 Despite all we have discovered about the evolution of the space jockey's seat from the Necronom V painting through Ridley Scott's storyboard, we can take a step back and examine Giger's final Space Jockey design and note the strange bulbous structure projecting from it's back and the three pillars that make the support frame connected to the runners of a sledge, have become the support frame for the space jockey's telescope. 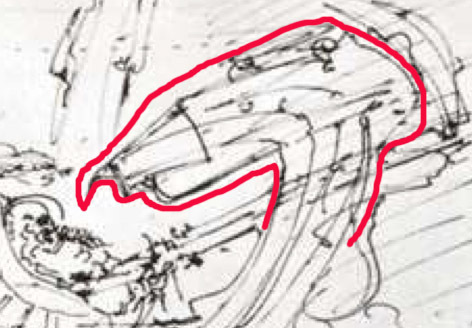 The presence of the horizontal structures such as the curving pipe as seen in the fourth image down on the right or if not, the sledge runners are likely to have inspired the horizontal pipes at the base of the Space Jockey's seat. 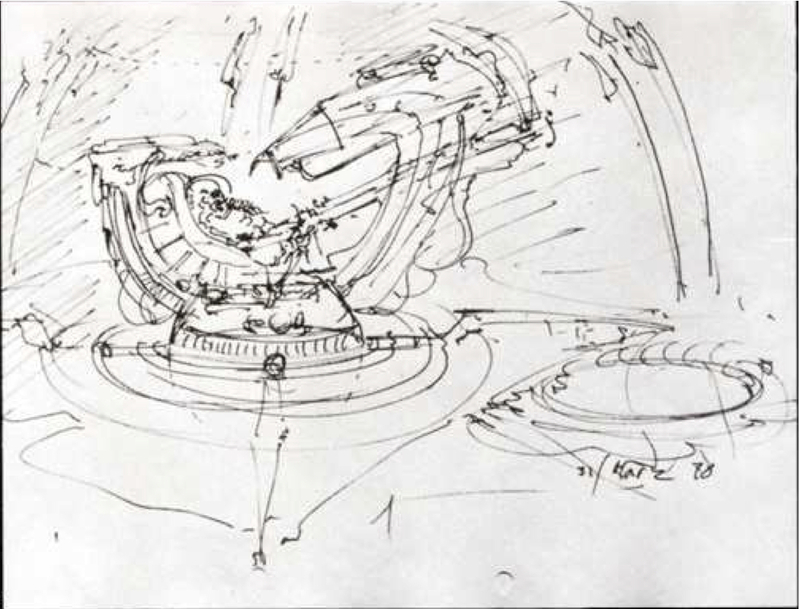 Giger would have been familiar with more than one version of the Henu Barque if the horizontal pipe at the bottom was based on the pipe shown in the second image of the funerary bark. See: Depictions of the Henu Barque. Someone might have the view that if the boat images contained a telescope, it might seal the whole statement that this was the inspiration. 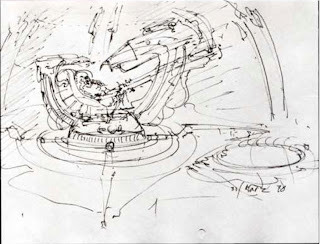 However I can only turn it around and look at Giger's earlier sketch for a space jockey chair design (see work 340c, Giger's Alien, p39 and the sketch of the detail below) where there is a telescope that might be considered roughly like a giant stylised falcon head shape ending with a sharp beak tip where the Space Jockey's telescope eyepiece would be, and on the barque itself, this is where a small falcon head would be found. depicted an astronaut in a rocket ship cockpit. See: Inspired by "Erich Von Däniken?" I refer you to "Prometheus and the Eagle" a plate in the Vatican City museum collection. 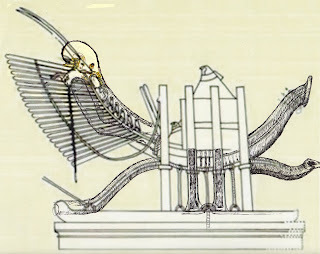 it features a recumbent figure and an attacking eagle in very much the same poseas the Space Jockey and the "birdlike" telescope. Hello Wmmvrrvrrmm, hope you're in fine fettle and that this is the right spot for an Egyptian diversion. I'm very taken with your explorations into the Book of the Dead and its latent influence on Giger and the Space Jockey. It is the one, the only thread that connects the human and the alien designs. Especially in Ron Cobb's Egyptian Wing Logo. Forgive my ignorance in this matter, which has probably been explored at length, but is the Wing Logo drawn from the motif found on the door lintels of the Second, Third and Fourth Gilded Shrines and the Canopic Chest from the tomb of Tutankhamun? well, I have to say that I don't know what the exact origins are because I haven't read anything from Cobb where he has said anything directly about its origins, but the concept of the Winged Sun Disk had been going on for a good long while before Tutankhamun, but what we see on the canopic chest does bear a lot of similarity in the simplicity although it's very flat at the top and the Tutankhamun treasures were still in people's minds just about, but for all I know there might have been a few of these images throughout Egyptian history looked at to get the full idea for the design. It's rather amusing to think that Bentley and Chrysler used to used the winged sun disk for their logo. The Bentley and Chrysler logos are a brilliant connection, one I'd never noticed before!